We hypothesized that pulmonary clearance vs. retention of metal oxide nanoparticles (NPs) is controlled not only by activity of phagocytes and other physiological mechanisms but also by the NP solubilization which, in some cases, may even prevail thus making the impact of these NPs on lungs quite feeble. To test this hypothesis, airborne Fe2O3 NPs with the mean diameter of 14±4nm produced by sparking from 99.99% pure iron rods were fed into a nose-only exposure device. Rats were inhaling these NPs for 4 h a day, 5 days a week during 3, 6 or 10 months at the mean concentration of 1.14±0.01mg/m3. Fig. 1. Structure of the multi-compartmental model for the kinetics of retention and elimination of the Fe2O3-NPs deposited in the pulmonary region of the lung. Here: ω is a function of particle deposition in the pulmonary region, and kji is a rate constant of particle translocation from compartment Xi into compartment Xj. Dotted lines are conventional boundaries between anatomical regions. We obtained transmission electron microscopy images of NPs within alveolocytes. Besides, the Fe2O3 content of the lungs and lung-associated lymph nodes measured by the Electron Paramagnetic Resonance (EPR) spectroscopy was gradually increasing with time. However, it proved much lower as compared with respective values known for the micrometric standard quartz dust DQ12 (having particle sizes of less than 5 µm) at similar exposure conditions. We demonstrated that free pulmonary cell responses to both particulates were virtually the same, but Fe2O3 NPs collected from the inhaled air, even though insoluble in water, dissolved markedly in the cell free broncho-alveolar lavage fluid supernatant and in the sterile bovine blood serum. This may be considered an in vitro model of their in vivo solubilization. 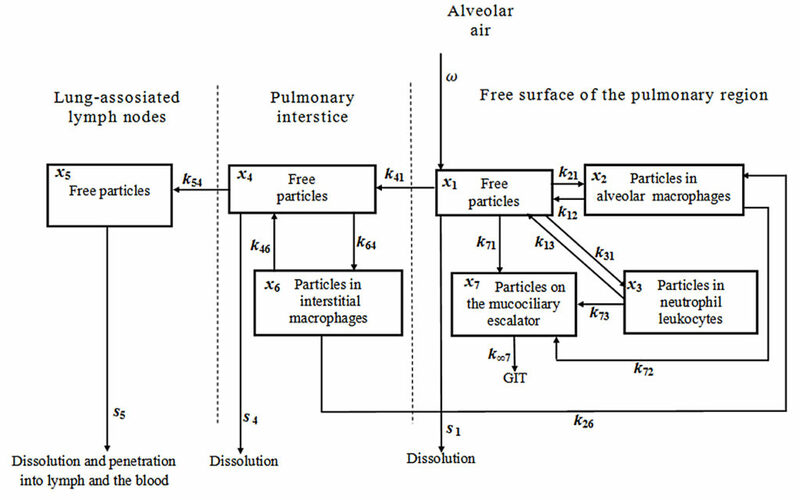 We have identified parameters of the multicompartmental system model describing the toxicokinetics of inhaled nanoparticles after their deposition in the lower airways as a process controlled by their (a) high ability to penetrate through the alveolar membrane; (b) active endocytosis; (c) in vivo dissolution. This model satisfactorily imitated experimental Fe2O3 and thus corranorated our initial hypothesis demonstrating that, as concerns iron oxide NPs of the dimensions used, the dissolution-depending mechanisms proved to be dominant. On the contribution of the phagocytosis and the solubilization to the iron oxide nanoparticles retention in and elimination from lungs under long-term inhalation exposure.